On March 18, 1990, after midnight, two men dressed as police obtained entry into the Isabella Stewart Gardner Museum in Boston. The pair blindfolded and handcuffed the guards and proceeded to steal thirteen pieces of art valued at $500 million. Twenty-eight years later the art is still missing … until now. When Karina Cardinal accidentally glimpses an infamous stolen painting, she faces a dangerous choice. Should she back off while she still can? Dig deeper? Or seek help from her old flame who is now a FBI agent? Either way, the next move she makes could destroy innocent lives…including her own. In Isabella’s Painting bestselling author, Ellen Butler, sets in motion the new Karina Cardinal mystery series with a captivating thrill ride into a notorious art heist. 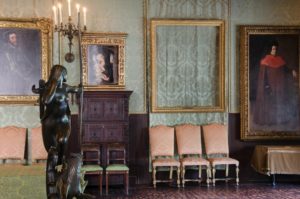 The Gardner museum robbery is considered one of the highest valued thefts of private property in history. FBI agents, investigative reporters, professional art recovery specialists, and amateur detectives have spent hundreds of man hours trying to locate the paintings. Karina Cardinal, an intelligent D.C. lobbyist with a sharp wit, and a curiosity to rival Jessica Fletcher, stumbles across something she shouldn’t. Her subsequent actions lead her down a dangerous path. 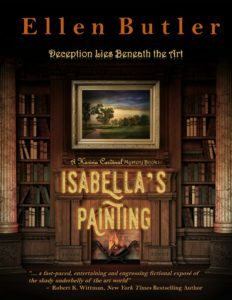 Get your copy of Isabella’s Painting today! Isabella’s Painting Arriving May 2, 2018. Enjoy the trailer today! Excerpt: Isabella’s Painting book 1 in Ellen Butler’s Karina Cardinal mystery series. 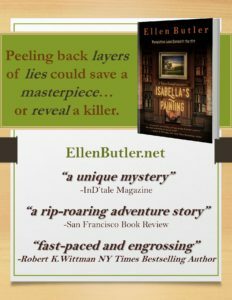 Posted on March 19, 2018 | Comments Off on Excerpt: Isabella’s Painting book 1 in Ellen Butler’s Karina Cardinal mystery series. The hallway was silent, but I could see well enough—tiny nightlights plugged into outlets intermittently lit the way to the grand staircase. My socked feet barely made a sound as I drifted down the steps. The tick of the grandfather clock in the front hall sounded loud to my ears, and I nearly jumped out of my skin as it struck the half hour with a sing-song chime. I stopped in my tracks with a hand to my chest. Finally, the last echo of the bells ended, and I carried on to the kitchen. It took but a moment to find a clean glass, fill it with water, and slug back the two little pills that would bring relief. When Patrick told me his mother had invited us to spend the night following the party, I’d originally thought it a fine idea. It allowed both of us to drink and not have to worry about driving home or getting a cab. Now, I wished for the comforts of my own bed. As I swallowed the last of the liquid, I glanced around the kitchen, also lit by nightlights, and found little sign of the party that had just finished a few hours ago. No glassware or dishes lined the sink, and the counters were wiped clean. The catering staff did their job well. I ran my hand along the quartz and saw a green light in the corner, near the ceiling, turn to red. It was one of the motion sensors Patrick had pointed out earlier. He’d said the motion sensors were only turned on when the house was empty. The light turned green again. I waved my hand, and the light went red. I guessed the sensors were always on by default, just not armed to trigger the alarm. Gently, I laid the glass on the counter. Something else came to mind that Patrick had mentioned. There were no cameras inside the house. Molly had put her foot down, and refused to allow Marty to install interior cameras, because she “didn’t like the feeling of being spied on in her own home.” His father relied on the pressure plates beneath the sculptures and artwork to keep them safe. When I’d asked Patrick about the hunting scene above the fireplace in library, he laughed and said it was practically worthless. His mother had picked it up at a flea market when they were a young couple, struggling to make ends meet. It held more sentimental value than a monetary one. The knob twisted beneath my fingers, and the low glow of the lamp came to life. Somehow my feet had drawn me down the hall to the library, and now I stood staring at the “worthless” painting. Though I valued the beauty and importance in historical culture, I knew very little about art. Living in the D.C. area, I had trotted through the art museums on the Mall for class field trips, and occasionally played tour guide for out-of-town guests. I could differentiate between a Picasso and Degas, but that’s where my expertise ended. The hunting scene looked good to me. The brush strokes were fine, and the bright red paint colors of the hunter’s coats drew me into the picture. Black and white hounds, their tails up and ears perked, seemed ready to dart off into the fields to find their fox. However, the painting wasn’t the reason I stood in the library now. Brazen curiosity could be the only explanation. My fingers pushed and prodded decorative pieces of trim surrounding the mantle, the fluted plinth, the center of a carved flower, the pineapple in the middle of the frieze. Nothing. I couldn’t shake the feeling something had moved in this area, and Marty had definitely been irritated by my barging in. Was there a hidey hole in the fireplace, or possibly a passage to a secret room? The residence was large enough to house a hidden chamber. I remembered reading an old gothic novel about an art collector who kept high-value artwork in a concealed room off the study. I felt like Nancy Drew searching for a clue. But a clue to what? When the fireplace yielded nothing, I turned in a circle. Floor to ceiling bookshelves lined both sides of the long walls of the rectangular room. A library ladder on rails stood midway down on the left side. It would take hours for me to test the books and knick-knacks filling the shelves. Besides, my instincts told me the books were the wrong track. The opposite end of room from the fireplace revealed a pair of French doors leading out onto the back patio and pool area. Marty’s antique desk sat closer to the doors than the fireplace. On it was a desk blotter, pencil holder, a few framed photos of family, and various bric-a-brac. The cleanup crew must not have visited this room because the brandy snifters from earlier remained. Chris’s still held liquid in the bulbous glass, however, Marty’s had been emptied. The leather chair creaked as I lowered myself onto the seat. Ahead of me rose the magnificent fireplace. The bottom drawer was locked, but the other drawers opened and closed with little effort and were filled with nothing unusual—files, paperclips, pens, a stapler. What had Marty been reaching for? I closed my eyes and allowed my fingers to feel under the lip of the desktop. Sure enough, some sort of catch met my searching touch. I pressed. There was a click. The hunting scene disappeared upwards to reveal another smaller painting. The grandfather clock began its chime, startling me. I jumped, pressing the hidden button, and the painting disappeared. In between the tolling, I heard a new sound—the creak of a floor board. Comments Off on Excerpt: Isabella’s Painting book 1 in Ellen Butler’s Karina Cardinal mystery series. It’s November of 1944 in Germany and adept American OSS agent Lilian Saint James has just been handed the perfect opportunity to insert herself into the home of a leading Nazi tactician, after saving the German army colonel’s young daughter from being run down by a car. After passing an investigation, she is sent to be a nanny in the Oberndorf home, where she begins to gather intelligence and take pictures of strategic maps of munitions factories, air fields and static U-boat locations that she hopes to pass on to the Allies. Her hopes are dashed, however, when the only two contacts available to her are neutralized by the SS. Fearing that her cover is blown, Lily must find a way to escape west past the battle lines into liberated France where, with the help of American Army troops, her undercover efforts are brought to fruition. After an all too brief recovery period, the ever-intrepid Lily, who refuses to be relegated to a desk job while the war continues, is requested to return to Germany to help rescue a downed British pilot and she jumps at the chance. Following this death-defying success, it would appear Lily’s days of intrigue are over, but again she manages to shrewdly insert herself into the action and, in the waning days of the European war, she arrives at the captured concentration camp of Buchenwald where she makes a discovery instrumental in identifying its horrific commanding officers who fled before the Allied arrival. Seasoned author Ellen Butler’s first foray into historical fiction with the World War II spy novel, The Brass Compass, is a magnificent success filled with characters that remind the reader again and again why the moniker “greatest generation” is so aptly applied. The carefully constructed first-person narrative, perfectly in vogue with the vernacular and popular culture of the era, is flavored seamlessly with the many tongues that the multi-lingual Lily must use to navigate in a dangerous world where it seems no one can be trusted. On its own, as a novel of intrigue and espionage, The Brass Compass would stand as quite an achievement, but the story truly hits the high notes with the romance between its Ingrid Bergman look-alike protagonist and Milwaukee gentleman-turned-army major. Physical beauty aside, it is the internal thoughts, and moreover, the impetus to “do something more” for the war effort which simultaneously drive Lily and the reader forward in discovering the horrors of combat and the triumph of love. After a long week lobbying on Capitol Hill, all Karina Cardinal wants to do is chill with Netflix and her boyfriend, Patrick Dunne. Instead, she’s slipping her aching feet into red stilettos for his parents’ annual holiday bash. When she accidentally interrupts Patrick’s father in his study, her embarrassment is tempered by suspicion that Martin Dunne and his dapper, secretive guest are hiding something. Maybe the painting she barely glimpses right before it disappears behind a secret panel. An internet search raises her curiosity to full-blown alarm. If she’s right, Martin is in possession of a stolen masterpiece. Infamous because everyone close to it has turned up dead. As in Mafia-style-execution dead. As she’s chewing over which instinct to follow—back off while she still can, or dig deeper for the truth—she crosses paths with FBI agent Mike Finnegan. An old friend and not-quite flame from her college days. When she looks into his warm, mocha eyes, she’s tempted to tell him everything. I am pleased to announce my next novel, Isabella’s Painting, will be book 1 in the Karina Cardinal Series. It’s a new thriller/suspense series featuring Karina Cardinal, an intelligent D.C. lobbyist with a sharp wit, and a curiosity to rival Jessica Fletcher. Karina’s inquisitiveness pulls her into one adventure after another occasionally putting herself or those she loves into danger. Right now, I’ve charted four Karina Cardinal novels with possibly more to follow. Fans of my contemporary suspense, Poplar Place, will enjoy Isabella’s Painting. Isabella’s Painting is currently slated for 2018. More details soon to follow. A D.C. lobbyist stumbles across a stolen painting at the home of her fiancé’s parents dropping a moral dilemma into her hands. Her efforts to do what’s right could jeopardize her engagement, and place her in the mafia’s crosshairs. 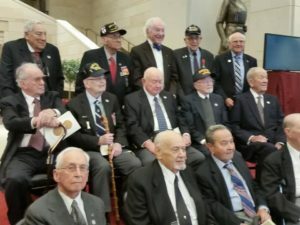 Female spies who risked their lives during World War II will be recognized with the 75th anniversary of the Office of Strategic Services (OSS), the precursor to the CIA. 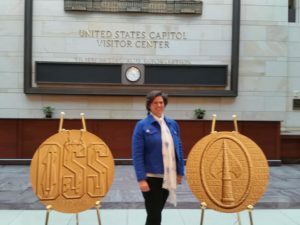 The OSS Congressional Gold Medal Act will honor around 100 brave individuals who are still alive with an award ceremony. Their bravery and ingenuity is displayed in The Brass Compass, a book being released on May 22, 2017 to coincide with the anniversary. Sabotage. S eduction. Couture dresses with hidden pockets. 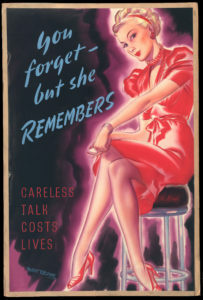 All were techniques and tools used by female spies recruited by the Office of Strategic Services (OSS) during World War II. These women were critical to Allied success and audiences have been thrilled by their exploits in novels and on the screen, yet their very real accomplishments have been ignored for generations. This year the OSS, which was the precursor to the CIA, will celebrate its 75th anniversary. And thanks to the OSS Congressional Gold Medal Act, its agents will finally get the recognition they deserve. 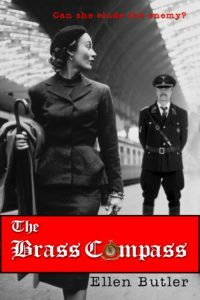 Just in time for that celebration The Brass Compass, a book set during WWII, will place one female spy in the spotlight. The novel reveals the extreme dangers agents faced when Lily St. James parachutes behind enemy lines, destroys rail lines, and infiltrates a high-ranking Nazi household. The Brass Compass is the latest story to celebrate the uncompromising intelligence and composure displayed by real operatives. From Greta Garbo in the film “Mata Hari” to Stephanie Meyer’s modern novel The Chemist, audiences are riveted by the tough-and-tender ways women approach espionage. These fictions reflect reality. By allowing women to utilize their natural talents and their specialized training, the OSS preserved freedom worldwide. 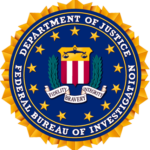 The covert intelligence program didn’t exist before December 7, 1941. The surprise attack on Pearl Harbor spurred President Franklin D. Roosevelt to create one overarching espionage office, formalizing it on June 13, 1942. Scrambling to cobble together an effective system, the OSS recruited without prejudice. Race, religion, gender, or formal education had no impact on ability. Often the people who became field agents were bilingual. They might have spent time living abroad, which gave them a natural familiarity with overseas cultures. That’s how Lily St. James, the heroine of The Brass Compass, becomes an Allied spy. With a diplomat for a father, Lily grew up in various locations throughout Europe. She is therefore fluent in French and German, both of which are invaluable for an operative. According to CIA historian Linda McCarthy, the war department knew that women excelled at infiltrating enemy networks and organizing resistance movements. Female agents became saboteurs, guerrilla warriors, mapmakers, propagandists, and communications technicians. In The Brass Compass, St. James calls on her training as well as her wits to fulfill a number of these roles. Like many of the agents who parachuted behind enemy lines in France, her life expectancy in the field is about six weeks. Fortunately, OSS spies had a specially designed arsenal. They used single-shot Liberator pistols, button compasses, and escape maps printed on silk. Espionage equipment tailored for female spies included shoes with hollow heel compartments, codes embedded in compact mirrors, and suicide pills disguised in jewelry. 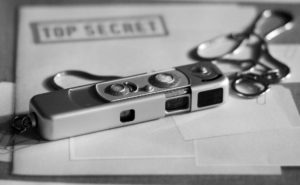 St. James makes use of false documents, hidden compartments and a tiny matchbox style camera invented by the OSS. Even with this specialized equipment, she must be clever. While working as a nanny for a German officer, the tiniest slip might prove fatal. Eventually she is forced to flee with mini-film hidden in a hollow boot heel. Although exposure and fatigue cloud her judgement, she does what she must to survive, and when she stumbles across a dead pilot, St. James takes his Victory Colt pistol and the photo of his lover. The pistol is a deadly weapon she will not hesitate to use. But she prefers flirtation and persuasion to wiggle out of tough spots, so the photo supports the story she concocts to evade enemy patrols. Seduction and evasion were used by “swallows,” female operatives who were astonishing effective. Betty Pack infiltrated the Vichy Embassy in Washington, DC, through seduction. There she secured the information needed for Operation Torch, the invasion of Vichy French North Africa. Even though the women of the OSS performed admirably, they struggled against a society that didn’t offer much respect. Doris Bohrer, who analyzed aerial photos and selected troop drop sites, said, “Everyone else was Lieutenant So-and-So, or Captain This. We were The Girls.” Despite the lack of respect, the women of the OSS persevered. Nowadays, female operatives are widely valued. Tamir Pardo, head of Israel’s Mossad, said, “[W]omen’s abilities are superior to men in terms of understanding the territory, reading situations, [and] spatial awareness.” Lindsey Moran, a five-year CIA veteran, believes that the agency’s best-kept secret is that their most talented spies are women. Awareness and assessment are key to survival, and these skills have been valorized in many films and books like The Brass Compass. 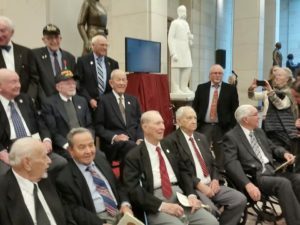 On the 75th anniversary of the OSS, agents who risked their lives in WWII will finally receive the recognition they deserve. 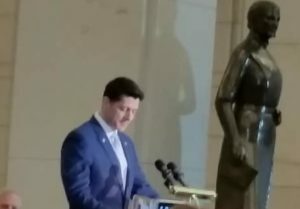 The program that spawned the CIA, the Navy Seals and the Special Forces will be lauded for the heroism and valor of its employees…whether they were men or women. On June 13, 2017, the 75th Anniversary, Ellen Butler will be presenting—A Celebration of the OSS 75th Anniversary ~ Highlighting Women’s Contributions, Weapons, and Training—at the Freedom Museum in Manassas, Virginia. Ellen Butler is an award-winning author whose grandfather was a WWII cryptographer. She is also a member of The OSS Society. The Brass Compass was inspired by the brave women who served in the OSS, the British Special Operations Executive organization, and the French Resistance. Butler will tour multiple states from April through July to present The Brass Compass and other books to readers. For a limited time Heart of Design and Art of Affection are available as part of a box set. Only .99c will get you some steamy romance stories from Crimson Romance. Don’t miss out on your box set. 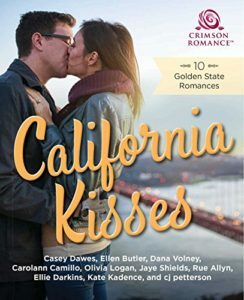 We’ve packed this bundle full of mountains, beaches, Hollywood glamour, sunshine, and wine, delivering romance the way only California can. Join these ten couples as they explore love in the state known for its golden dreams. A picture paints a thousand emotions in these eight tales of colorful romance. Don’t miss a stroke of these wonderful stories of inspiration and passion. The Brass Compass Video Trailer is now live for your sneak peek enjoyment.